The holiday season is a time of merriment and of goodwill and of cheer so thick in the air that it seems you can almost touch it, smell it and taste it. After all, what better manifestation of the holiday season is there than the food — from the sprawling spreads of festive holiday feasts to the vast array of candies, cakes and cookies that warm and sweeten even the chilliest of days. Their fragrances as they simmer on stovetops and warm in the oven add spice to the grayest of December days. While pies and cakes certainly hold their own as seasonal confections, cookies play leading roles during the holidays in iterations ranging from the simplest of sugared doughs to artfully executed and mind-boggling, complex combinations of spices and jams and icings that prove that a cookie is not just a cookie — it’s a gift for the senses. Making cookies from scratch is an art; it takes the right proportions of ingredients mixed just so to achieve perfection. And, as anyone can tell you, the perfect scratch-made cookie fresh from the oven is a thing of beauty. Naturally, there are ways to streamline cookie cookery. The warmer dough gets as you work it between your hands, the harder it becomes to control. When it comes to dough, the rule of thumb to remember is that the firmer it is, the better the cookie will take shape — literally. “Chilling the dough before baking helps ensure that cookies maintain their shape and stay thicker for a softer finish,” said Justine Gudmundson-McCain, owner and head baker at Bluejay’s Bakery in Pensacola. A professional baker for seven years, Gudmundson-McCain definitely knows which way the cookie crumbles — and how to keep them from crumbling. “The longer you chill your dough, the more the flavor of the extracts you use is intensified, and that longer chill time will also allow the flour in the cookies to absorb the butter to cut down on that raw floury taste after the cookie is baked,” noted Shanelle Long, whose talents qualified her for her job as exclusive cookie artist and cake master at J’s Bakery in Pensacola. A few other helpful hints to achieving baked brilliance? “It’s important to cream room-temperature butter and sugar together first to make sure the butter breaks down evenly, which will prevent chunks from forming in the dough,” Gudmundson-McCain advised. The best dough, however, doesn’t guarantee the perfect color or texture; the last proving ground is the bake, itself. 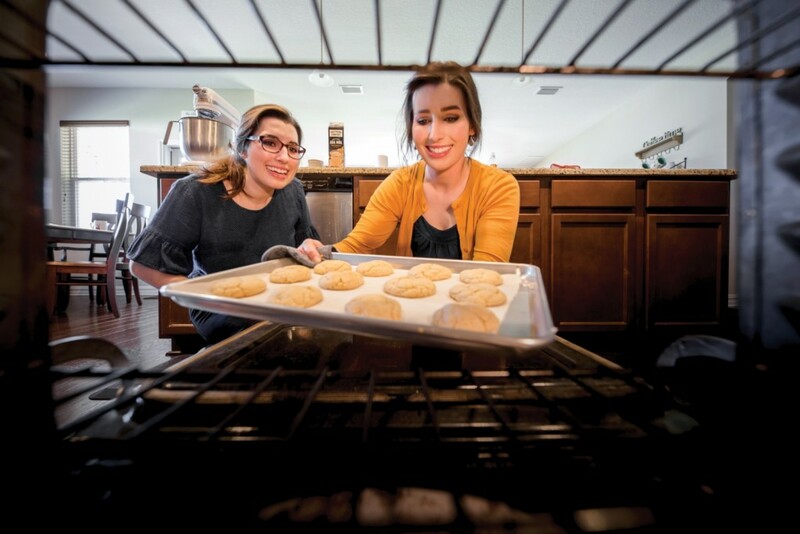 “Every oven cooks differently, so timers should be used only as a guideline — keep an eye on the cookies so they won’t over-bake,” said dynamic duo Courtney and Ashley Cook, the baking brains behind the delicious cookies and confections at Cook Girls’ Bakery in Panama City Beach. For home bakers as well as professionals, the holiday season is the time of year when the best recipes are broken out with abandon, flipped through and studied in preparation for holiday gift-giving and party time. ’Tis the season that requires cookies in abundance, and that’s something that takes time, commitment, and the willingness to get your hands doughy and try something new. Have fun and don’t be afraid to make a recipe your own, the Cook Girls encourage. So, instead of sticking to traditional, unadorned shortbreads and sugar cookies, why not use warm spices, extracts and add-ins that evoke the holiday spirit? Allspice, pumpkin pie spice, ginger, cinnamon, nutmeg, cocoa, peppermint, cranberries and nuts — go nuts and be creative. Even if you burn your cookies or have to trash a few failed attempts at doing something not so cookie-cutter, you’ll still end up on Santa’s good list, and you’ll have some stories to pass along with the cookie plate.